[Update - 19/7/13 - Things have taken a pretty sticky turn since the news of this impressive benchmark performance first appeared. It seems all may not have been quite as it first appeared. 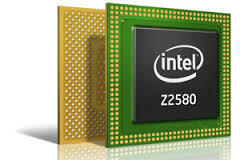 While the ARM competitors in the tests were using a standard compiler, Intel had supplied a special compiler for the tests running on their chip - and it was bypassing some of the steps..! Whoops..! A similar positive view of the Clover Trail's performance has been been published here. This analysis also shows that it promises to use around 40% less power than comparable ARM phones and tablets. With things like the screen also being pretty power-hungry, this more efficient processor won't translate to a 40% drop in the power demand for the whole device, but it is a step in the right direction for mobile computing adding an hour or two to battery life, or allowing the device to be lighter, or to support a larger or brighter screen. The first proper competition to ARM chip designs in the mobile space could well also lead to a further price drop for the chips and the devices they power. That would certainly seem to be the prevailing view in the financial markets, where the ARMH stock price has not fared so well over the last few weeks. Not all the benchmarks were quite so good, mind. While the scores on AnTuTu and SunSpider were very good, the device did not do so well on Quadrant. See the results here.